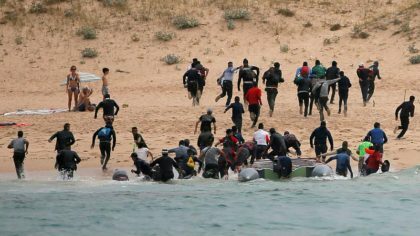 Morocco thwarted 89,000 illegal migration attempts to Europe in 2018 as the country became the main gate for migrants willing to risk their lives in the Mediterranean sea to reach Europe, the National Observatory for Migration said. The North African country, a migrants’ destination itself, became a main gate for Europe after Italy pushed for tighter control of embarkations from Libya and after the closure of the Balkan route with the EU-Turkey deal. Eighty percent of the illegal migrants stopped by Morocco were foreigners while 229 trafficking networks were busted last year, the Observatory, an offshoot of the Interior ministry, said in a report. During the same year, Morocco rescued 29,715 irregular migrants at sea while 5,608 chose to voluntary return to their home countries, the report said. Morocco has already received €30 million from the EU, which said it will transfer this year another €110 million to help the North African country tackle illegal migration. According to figures released by the International Organization for Migration, 111,558 migrants crossed the Mediterranean last year. About 50 percent of them made their way through the west. Last year, over 2,242 irregular migrants died on migratory routes in the Mediterranean, including 769 using the western Mediterranean route, the IOM said.